Available only in 1-bedroom cabins. 2-night cabin stay. We will need at least a one week notice. Half of payment is due at time of booking. If you have ordered our Romance Package and cancel your reservation, you will not receive a refund. All dinners are complimented by the appropriate condiments to enhance your dinner. These items are your to keep. 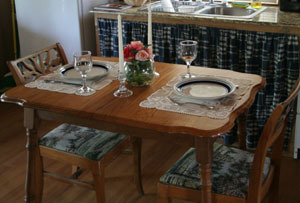 NOTE: The table is set with dishes from the cabin and must remain. 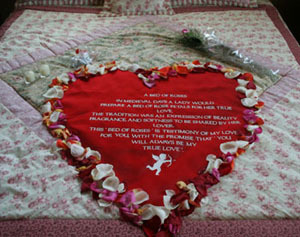 __In medievel days a lady or gentleman would prepare a bed of roses for their lover. The tradition was an expression of beauty, fragrance, and softness to be shared by lovers. A truly loving gift for your true love.